There are a few things certain in my daily routine that I have to do each and every day. No matter what. Wake up (I hope) and make the bed. Pop some clothes on. Get mine and my Children’s breakfast ready and brush my teeth. Also, once these first few jobs have been done I have to walk Mollie The Collie. She is always excited to get outdoors and will not leave me alone until she has had her first walk of the day. No matter what the weather is like. Not once has she thought, Oh it is raining today, I will let Mum stay inside and I will just chill!! This means I have to brave the Great British Weather!! No time to be ill, when you have a dog. We go walking everywhere. Through parks and woods, streets and trails. A good few hours each and every day. Just lately with this current spell of wet weather, I have been fed up trying to dry trainers out. Nothing worse than soggy trainers. 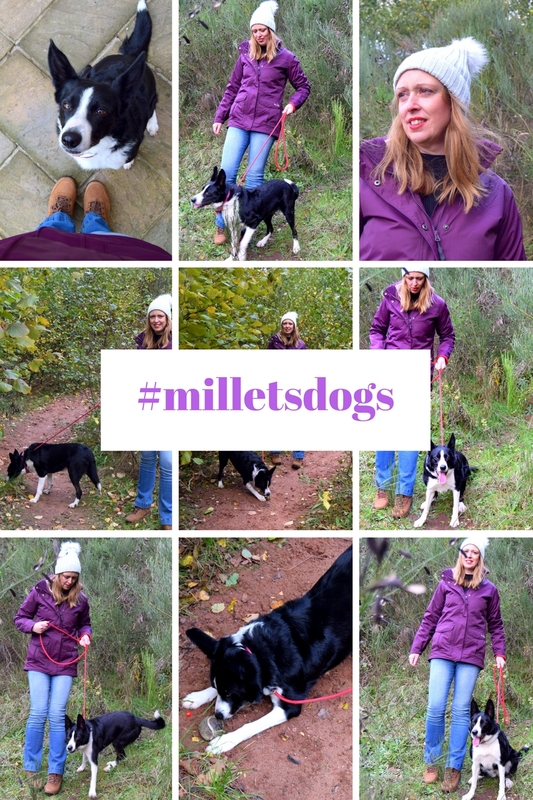 Thankfully Millets have come to the rescue and asked me to take part in their Take The Lead collaboration. Millets wanted to make this cold wet spell a little easier for me. They asked me if I would like to choose a waterproof jacket from their Women’s Jacket’s collection. Also some proper walking shoes from their Women’s Footwear hero collection. To help me embrace those Winter walkies. The Peter Storm View Jacket boasts versatility and protection. Wear the waterproof shell in a downpour, the fleece when there’s a slight chill and zip them both together for the ultimate weather protection. Features- Interactive zip – wear the jacket and fleece together or separately for ultimate versatility. Outer shell- Fully waterproof – Storm Shield+ technology offers a 5000mm Hydrostatic Head, taped seams and a breathable performance to offer superb weather protection. Rollaway hood – adjust for the perfect fit or tuck into the collar when not in use for extra protection and comfort. Mesh lining – located in the hood for added breathability. Multiple pockets – 2 hand warmer pockets and 1 zipped inner pocket. Elasticated cuffs – for a more comfortable fit. Adjustable hem – drawcord system to customise the fit. Waterproof – rain protection with a breathable performance to keep you dry and comfortable on the trail. Vibram® outsole – unbeatable grip on all terrain including wet and rocky trails. Cushioned underfoot – the EVA midsole provides added comfort and support. Comfortable footbed -the PU footbed offers a lightweight and flexible construction. How lovely!? A proper pair of walking shoes and a jacket suitable for all weathers. Perfect for lots of walking. You can always guarantee Mollie will find something on our walkies. Luckily for me, this time it is only an old tennis ball!! I am really pleased with the things I picked out. The shoes will do some miles over the next few months and this jacket will keep me warm and dry too. Brilliant. What do you think of my all-weather jacket and new walking shoes? I got to pick out a jacket and some walking shoes to review. All thoughts are my own and I was not paid for this post. Best Friend Day: Have A Super Relaxing Weekend Just Like Mollie! #WeekendLinkUp. Happy Pet Day: Mollie The Border Collie. A Day In The Life Of Mollie The Collie: It’s A Tough Life Being A Dog. "25 Halloween Recipe Ideas To Try Out This Halloween"
That coat is great! Love the color!! Looks a great jacket. Really warm looking and I love that colour. That is a gorgeous jacket; perfect for this miserable British weather! Love the colour too! Thanks for linking up to Top of the World Style. Now imagine a husky who needs a lot of walking and that even at 40 below zero. I am glad that cats don't want to go out in miserable weather. Such a cute dog! I love your purple jacket! That jacket looks really nice and those boots look comfortable! Sometimes I miss my dog because I always had to take him out, which got me walking too. Thank you Michelle, aww I can imagine how you must feel. It's a lovely jacket! I love the colour! What a great jacket. Love the colour.